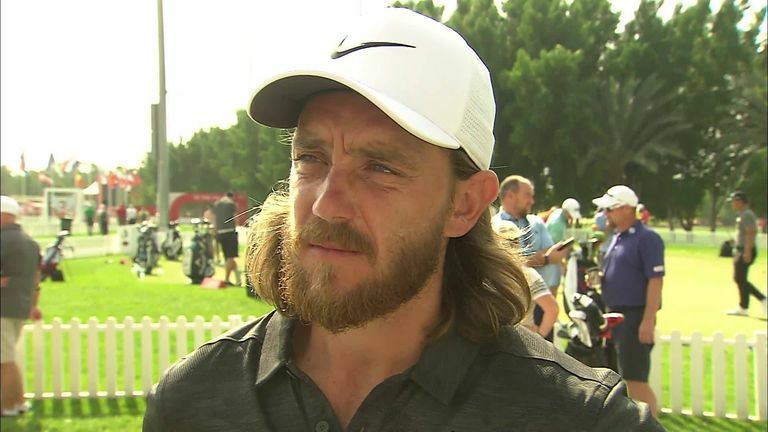 Tommy Fleetwood admits he was disappointed to collect only one title last year and outlined his determination to increase his silverware count in 2019. For the second year running, Fleetwood got his campaign off to a winning start at the Abu Dhabi HSBC Championship, and he is looking forward to the challenge of completing a hat-trick this week against a high-quality field that includes the likes of Brooks Koepka and Dustin Johnson, the world No 2 and 3 respectively. Fleetwood enjoyed a consistent 2018 without managing to add to his early victory, posting 10 further top-10 finishes worldwide including a runner-up finish at the US Open, when he closed with a stunning 63 at Shinnecock Hills before Koepka held his nerve to defend his title. The Englishman ended the year ranked 14th in the world, but he is looking to climb back into the top 10 after spending his winter break working hard on his game while also testing new equipment. Asked to evaluate his overall performance last year, Fleetwood said: "I was disappointed, which is a strange thing to say, really because I had such an amazing year and I was doing different things. I played a lot in America last year, that was my first full year over there and there are different challenges. "I also played two team events last year, so it was a very different year, and I kind of solidified my place in the top 15 in the world, which was big because I had made a rapid climb. That's all well and good, but you've got to keep going and keep improving, and it gets much harder to stay there. "Only winning once, after winning straight off, was disappointing, but I think at the same time, given the good golf I played, it just shows how hard and difficult it is to win. It's not a reflection on me doing things wrong, it just says it's very difficult to win. I came close and just didn't do it. "But at the end of every year, you sit down and you look at how you can improve. That's what we all did, everybody that I work with. We're just going to go along that path of trying to get better, whatever the state of my game is or whatever I need to improve. That's where our main focus will be. "You know, in the end, hopefully that results in wins, but again, coming back to this event now that I've won twice, not once have I sort of came first event of the year and thought, 'oh, I should win this or I'm going to win this'. "It's like you play with confidence but with sort of an ease of expectation on yourself because it's very early on in the year, and that's gone well. So I'm just trying to look at my game and improve and think about what I want to be as a player, and hopefully that results in some wins." Fleetwood is armed with a new set of irons as well as a new driver this week following some extensive testing sessions in California, and he admitted his new set-up left him unsure of how he would perform in tournament conditions. "I've been trying things for a long time now," he added. "I spent quite a bit of time in San Diego last year, trying all different manufacturers. You don't really get the chance throughout the year, and then you get the chance again as the year ends, but I had a pretty dry spell of not playing golf, so the only time to test is now, really. "I had a week of practice last week, and trying everything we can. The problem with testing is we play such a busy schedule, and even if you're at home and you play, it's not the same as being at a tournament. I've got a new driver this week. I've got new irons, which I guess is the one that everybody's seen. "But eventually, you have to try them in a tournament, otherwise it means nothing. Literally, going on a course is the next step, trying everything on the range. Next week, Thursday could be a completely different scenario. "At some point, I need a more long-term solution. If you think about it, my career, I've had the same set of clubs for six or seven years, so I need to get it fixed. You just have to put them on the golf course. It's the same with a golf ball or driver or a putter or anything. You just have to try them and we'll see how it goes, really."